Cloaked in black with gold accents, the Diamond Previews Exclusive Adam Ape figure (500 pcs) from HK artist Winson Ma and Play Imaginative is the dark counterpart to the red original colorway. Best known for his incredible 1:6 scale figures created as part of the legendary Brothersfree and now for his own Winson Classic Creation, Winson Ma created Adam Ape, his first vinyl figure, as a counterpart to his hyper-detailed 1:6 Apexplorers line. While Adam Ape's encounter suit marks his identity as an intrepid explorer, his airbrush and mini-ape accessory reveal his creative side. 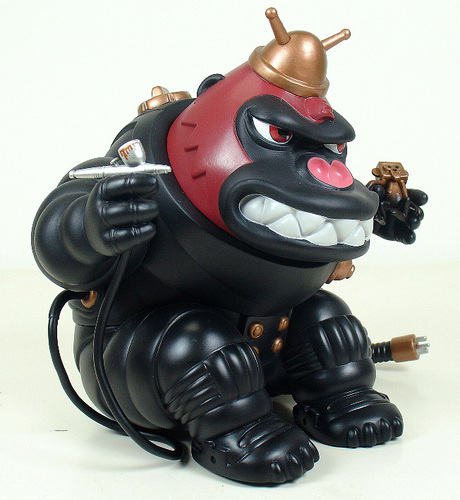 Winson's design mixes his love of intricate detail with a menacing yet comical ape character with an expressive face. Speaking of menacing, Adam's head can be removed to reveal a golden skull. Adam Ape ships with an exclusive signed and numbered print from Winson Ma. 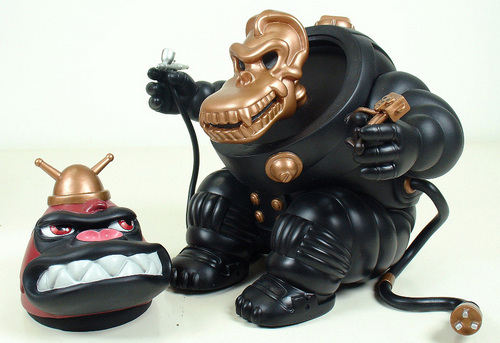 The Dimaond Previews Exclusive Adam Ape is available from designer toy retailers and specialty shops. Feeling lucky? Thanks to the generous folks at Play Imaginative we have not one but three Black Adam Ape figures to giveaway. To enter just write a comment on this post by the deadline of Monday, October 22nd, 2007 @ 8 PM PDT. Good Luck! 1. To enter write a comment to this post. 2. Deadline to enter is Monday, October 22nd, 2007 @ 8 PM PDT. 3. Duplicate entries will result in disqualification. 4. Three randomly chosen winners will each receive a Diamond Previews Exclusive Adam Ape figure. 5. Winner must respond to our notification within 72 hours.